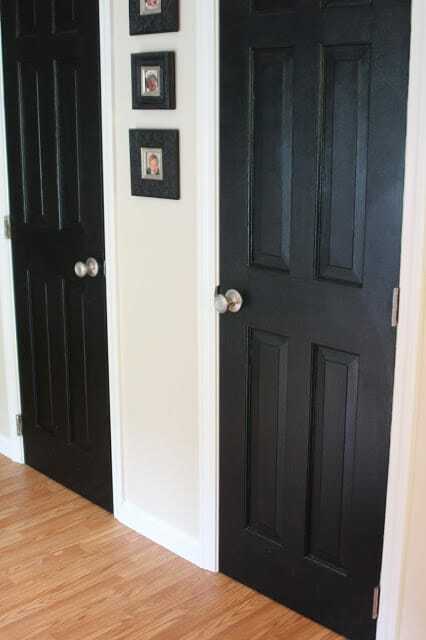 Thank you everyone for your kind words about my black interior doors! I know they are not for everyone, or every house, but I really love them in mine. They make our house feel a tiny bit less basic. 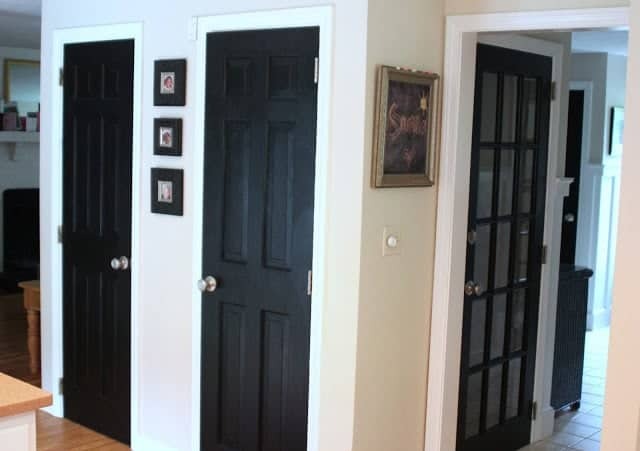 I asked my kids what they thought about the black doors and they all thought I should paint the trim around it black as well. Ummmm – okay, crazies!! However I DID just freshen up the trim and wanted to talk to you about it. If you’ve been around here for a while you know that every nook and cranny of our house was either an orange natural wood or painted a shade of peach, orange, or dusty rose. 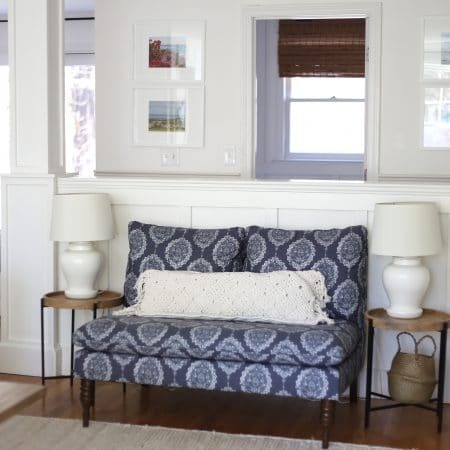 The kitchen doors and trim that were peach became white, but between the dog, kids and a lot of life being lived in this room, it was quickly apparent that the previous owner’s painter had not primed the varnished wood before the coat of peach. The white paint, along with the peach underneath, scratched right off. 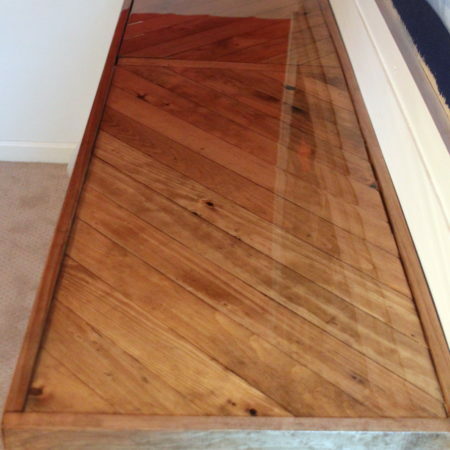 If you are painting raw or varnished wood, prime before painting!!! 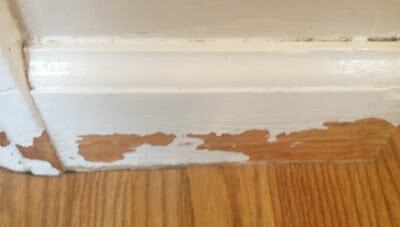 Primer has better bonding capabilities than paint, so it is less likely to chip or scrape off. It will adhere better to the surface than paint alone. 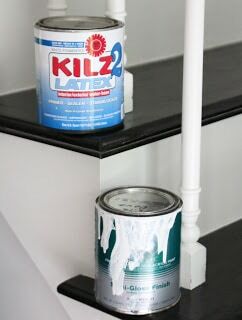 I painted all the varnished and painted trim in my house with oil based Kilz or BIN 1-2-3…. As far as durability, I still think using a water based primer is a huge improvement over not using any primer at all on raw or varnished wood. 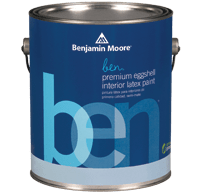 I have also tried many different paints over the years but always come back to Ben Moore, because in my opinion their paints have the best coverage. My local hardware store only carries the BM Regal line so I end up using that frequently, but I do like the “ben” line of their paints, which are low-VOC and a little bit less expensive than the Aura or Regal lines. 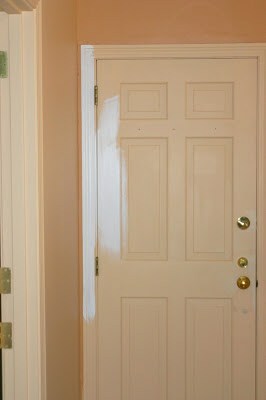 After scraping, sanding, and priming, all the trim in the kitchen got a fresh coat of paint. There is nothing like a fresh coat of paint to make this girl happy!!!! I’m not promising those baseboards are going to stay nice and clean, but they are today!!!! It’s the small things, my friends. More kitchen dreaming tomorrow! See you then. I'm a huge fan of Ben Moore paint too. I finally used the Aura paint (thanks to a coupon for a free gallon), and let me just say, that stuff is the BOMB. Seriously – covers like nobody's business, and goes on like a dream. I'm a huge fan. I even painted my husband's office in a matte finish – that tells you how good it is. You can also touch up without it being obvious – another bonus. I can't get over how peachy your house was! You don't fully appreciate it online until you compare it with the crisp white. Wow! Looks amazing! I'd be dancing in the streets if all my baseboards and trim had a fresh coat of paint! 🙂 SO worth it to do a job right the first time, I know from experience! these are all great tips and yes prime prime prime! 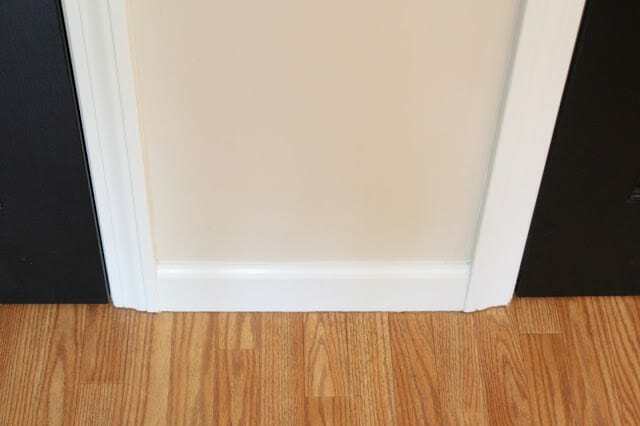 i actually use the oil stuff for my trim now- i tried the water based one and have to go back and do that room- it just didn't stick to the quarter round, even though i sanded it first. so now i just go with the oil because i only want to do it once!